Commoner: No one tells a lie after he's said he's going to tell one. 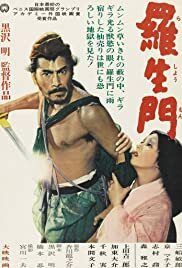 Kurosawa tells a story four times through different characters. The characters tell the story different four times. In flash-backs, all as the characters tell them, we see the stories. Are they lying, are they all telling their own truth or is there someone who tells THE truth? The way this is handled by Kurosawa is absolutely masterful. Of course, his direction is great. Together with cinematographer Kazuo Miyagawa they do a tremendous job with the atmosphere in the woods. With perfect light angles it looks beautiful.